I tried it again today. I tried to go shopping at the mall for kid’s clothes. My son needed some jeans (“soft” jeans mom) and so I knew I needed to check out several different stores. After finding 9 pairs in different sizes (because he grows every time he needs a pair of jeans for a band concert), my body rebelled. My lower back was screaming at me to sit down. But the nerves running along the side of each of my right leg were just as loud. My toes were going numb. That’s it. No more malls or big departments stores. I am going back to the easy way to shop for kids clothing is online. And I will not look back. By the way, do you know how much 9 pairs of jeans weigh? I can’t. I simply can’t shop for clothes (whether for myself or my kids) “in person.” Shopping for kids clothes online has become my trick to outsmart my aching body. Let me tell you about the easy way to shop for kids clothing. Do it online with stores that make it easy. *This post contains some affiliate links for your convenience. This means that if you click on one of these links and make a purchase, I will receive a small commission. 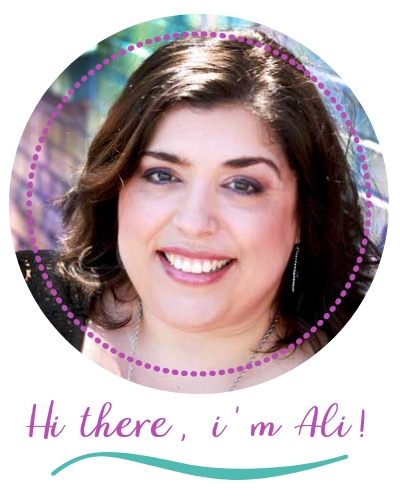 This does not cost you a penny more and Is one of the ways I support my blog and family. You can read my full disclosure policy here. 1. Only shop for kids clothing at online stores that offer free returns or Stores that have a physical location near you. Don’t be fooled by free shipping. Unless it says “free return shipping,” don’t waste your money taking a chance that the items won’t fit. I don’t know if you have tried to ship something back to a store lately, but I returned a few pair of shoes one time and it cost me $35! So, I don’t even look at online stores unless they offer free returns. 2. Wait for a big sale or a crazy good coupon the online store offers. This will, of course, save you money (Yay! ), but it will also save you time and energy. I love to shop at Kohl’s, but I always wait until I get a 30% off coupon to shop for my kid’s clothes. Then, I make a list of what each of my children needs and make a big order. That also means that I only have to make one trip to the store to do my returns. Of course, this gets me funny looks and sometimes grumpy salespeople, but I either ignore it, or lay the guilt trip on them about how I live with pain every day and I have a handicap tag hanging from my rearview mirror to prove it. Kohl’s is really my go-to for my kid’s clothing. They have a great selection and the clothes are a nice quality. The coupons are great and you get “Kohl’s Cash” during some promotions. I highly recommend Kohl’s if you have one near you and NEVER pay full price for anything at Kohl’s. There will always be another sale. JcPenney’s is my next most favorite online store for kids clothing. I like the selection for elementary school size clothing the best. And JcPenney is “coupon crazy.” In fact, I am glad I shop JcPenney’s online more because every time I am in the store there are insanely long lines. I shop on Amazon almost daily (at least that’s what my husband thinks.) When it comes to kid’s clothing, I only purchase if it says “Free Returns” in the descriptions. And you have to be careful because sometimes only certain sizes and colors have free returns. I am not sure why. I am a proud Amazon Prime member and it is so worth the yearly fee. Case in point, I just found out my teenage son has Band Picture Day this week. He has to wear an all-black outfit and of course, the one from last year doesn’t fit. So I went onto Amazon and ordered several sizes of slacks and shoes and they will be delivered in two days. I won’t have to trek to the store at the last minute (like I did for his jeans) and I can easily package the items that don’t fit and send them back to Amazon! The Gap has a certain style of clothes that I usually like when I am buying matching/coordinating outfits for my kids for family pictures. They don’t have as wide of a selection in kid’s clothing, but their styles are classic, the quality is amazing, and my kids always look well “put together” in their outfits. Old Navy is good for everyday wear clothes. For school shopping, I can find all the basics of kid’s clothing-jeans, shorts, t-shirts, socks, pj’s. It seems like every year my daughter finds a really cool jean jacket at Old Navy. Really high quality clothing is Gymboree’s best feature. Most people think of it as expensive, but if you watch their sales you can really get some great deals. Since they put out different “collections” each season, they are always marking down the old collections. The styles are classic so you would really never know the difference. And if you use the “Gymbucks,” boy can you really score some great deals. This kid’s clothing store is in the Gymboree family. Their prices are slightly less and the clothing styles seem to be more trendy and change with the different fashion fads. You can find some really cute clothing for your kids and boy do they always have a huge clearance section. Since they added the “Cat & Jack” collection, I am really finding a lot of kid’s clothing that are becoming my favorites. Check out the Target Cartwheel app, and you will never pay full price for your kid’s clothes. The shoe section also really impresses me and I find they are great quality and hold up well. My youngest just got a pair of the cutest unicorn boots complete with a fuzzy tail on the back. When my kids were babies, I almost never shopped anywhere else. I am not sure how prevalent the brick-and-mortar stores are nationwide, but we have one near us. Carter’s is know for quality and have great sales almost regularly. Anytime I am looking for a piece for an outfit (mostly for my girls) that needs to have a little pizazz (yes, I really just used my mom’s go-to word) I find it at The Children’s Place. They have great accessories and I buy all of my kid’s socks there. At times, I have also paid under $3 for a pair of jeans. Wow! Read More Chronic Illness Life Hacks . . . So next time your kids need clothes, start online and you won’t regret it! I hope I have given you enough online stores that have kids clothing to get started. Having a chronic illness, you need to use your energy judiciously. 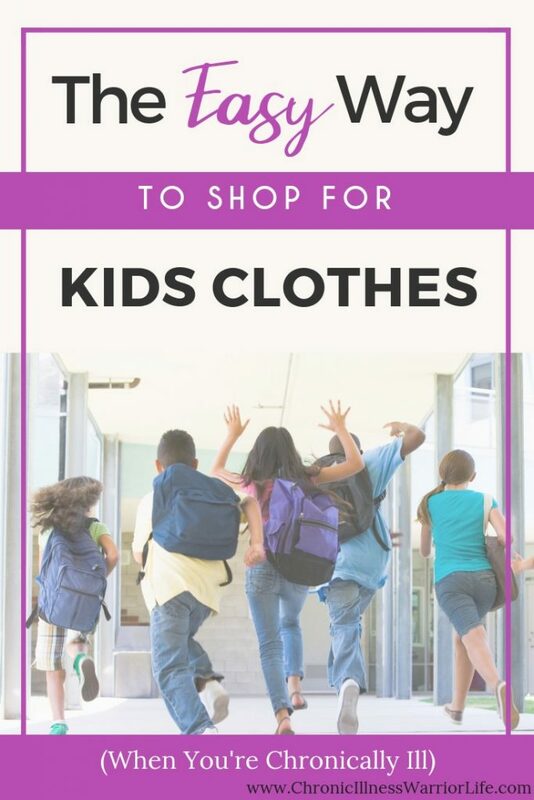 Using this no-fail easy way to shop for your kid’s clothing is a smart life hack you can add to your list. What are some of your favorite places to shop online for kid’s clothes? P.S. Do me a big favor and How to Make Shopping for Kids’ Clothes Easy? I really appreciate it!